The largest permit issued in 1947 was valued at $2,000,000 and for the Mann Avenue rental housing project. Image: Ottawa. City of Ottawa. City Living Developments. Ottawa: City Living Ottawa, 1984, p. 15. That’s something I tell myself frequently, so it was a little surprising to hear it coming from the list of building permits issued in 1947 replicated in Ottawa Building Inspector C. Maxwell Taylor’s 1947 Annual Report. What was the source of those whispers? Since my thesis has to do with the early years affordable rental housing initiatives in Ottawa, there were two. The single largest permit issued by the City of Ottawa in 1947 was for the Mann Avenue Project. Better known today as Strathcona Heights, the project was originally comprised of 64 buildings for a total of 418 apartments. 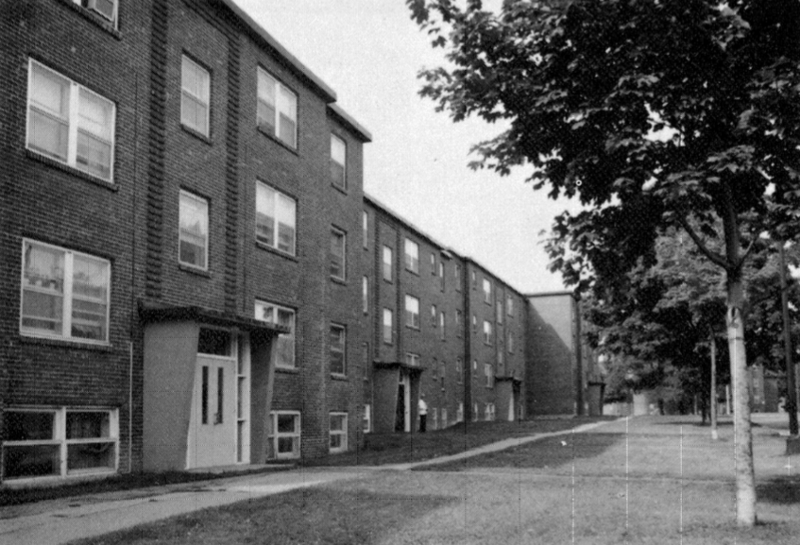 As one of the last planned during the short existence of Housing Enterprises Limited, it was subsequently taken over by the CMHC and seen to completion.1There is much more to write about the project, but I did put a little something together in my story “Ottawa’s Apartments, 1955” this summer. Two of Economy Housing Limited’s shoe box homes. Image: Google Maps (April 2009). The second initiative was led by a private sector consortium headed by William Hayley, son of Harry Hayley, Ottawa’s cinderblock king, and was dubbed Economy Housing Limited. The project’s point was, in short, to demonstrate that the private for profit housing sector was capable of solving the housing crisis of the day.2There are many more details to the project, but the goal was to demonstrate that basic homes of about the same size could be constructed for about half the cost of those on Merivale. “Company Formed to Build 35 Cinder Block Houses,” Ottawa Journal, July 16, 1947, p. 13; “Houses for 33 Veterans,” Ottawa Journal, September 15, 1947, p. 4. 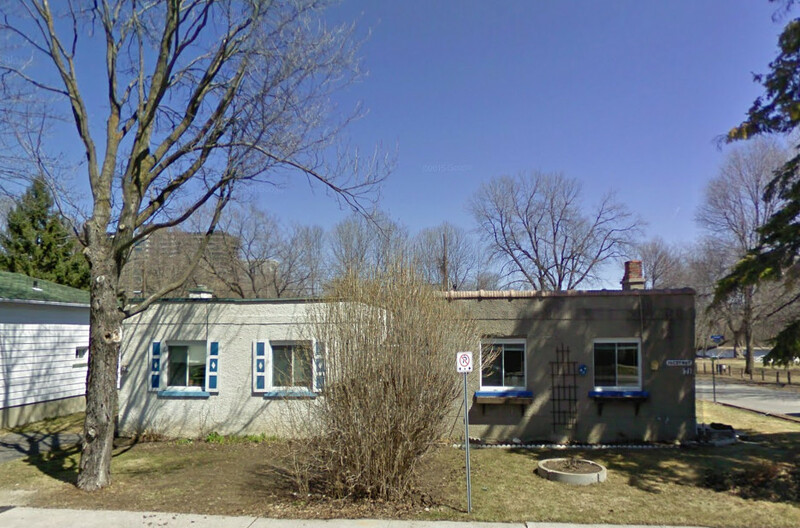 In both of these cases, the project’s successes and failures were instructive to the limited dividend approach that was ultimately taken by Charlotte Whitton and Cecil Morrison for the Ottawa Lowren (“Low Rent” or “Low Rental”) Housing Company. 1. ↥ There is much more to write about the project, but I did put a little something together in my story “Ottawa’s Apartments, 1955” this summer. 2. ↥ There are many more details to the project, but the goal was to demonstrate that basic homes of about the same size could be constructed for about half the cost of those on Merivale. “Company Formed to Build 35 Cinder Block Houses,” Ottawa Journal, July 16, 1947, p. 13; “Houses for 33 Veterans,” Ottawa Journal, September 15, 1947, p. 4.